Eight years ago, a Grand Rapids congregation left its stately but deteriorating church for a plain, empty building in a tough part of town. Today, the risk has paid off with a smaller but committed congregation heavily involved in neighborhood ministry. Dennis Johnson readily admits it: one of the reasons he and his wife, Donna, joined Bethlehem Lutheran Church 30 years ago was the building. He loved its neo-Gothic architecture, its handsome woodwork and its majestic organ. this stately building, the church's home since 1933. 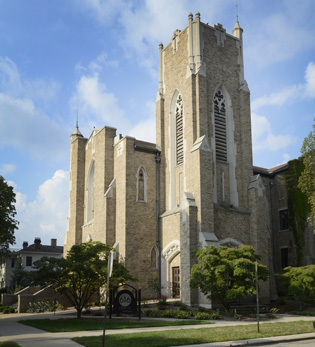 “It was my image of what a good Lutheran church should look like,” Johnson said of the stately structure in the historic Heritage Hill district of Grand Rapids, Michigan. His image of a good church, however, turned out to be far from where this now 142-year-old congregation decided it needed to go. Today, Bethlehem’s new home looks nothing at all like a traditional church. It is a nondescript former post office maintenance garage, set in the city’s gritty Heartside neighborhood of soup kitchens and lost souls. Johnson used to drive his children through Heartside to see how “the other half” lived. He never imagined he’d end up worshipping there, in a building right next to a homeless shelter. 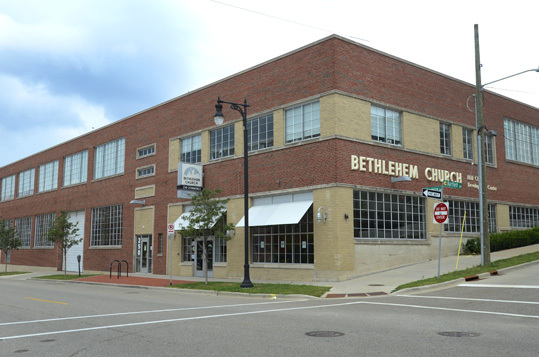 Bethlehem Lutheran now meets in a former post office vehicle maintenance garage, located in Grand Rapids' Heartside neighborhood. But when Bethlehem’s members decided in 2007 to sell their old building and buy this one, Johnson voted yes. And though at first he had his doubts about the new building -- which does not have a pipe organ, merely a piano -- today he is sure it was the right move. What is your image of church? How essential is a building to that image? Others agree. Relocating the Evangelical Lutheran Church in America congregation from leafy Heritage Hill to struggling Heartside not only brought it closer to people in need; it also revitalized an aging membership, they said. Faced with a choice of pouring money into a deteriorating building or energy into ministry, Bethlehem took the more biblical path, said the Rev. Jay Schrimpf, its pastor since 2001. Bethlehem’s move was a radical and risky response to a problem facing many older, mainline congregations: what to do with beautiful, aging buildings while seeking new and innovative ways to be a church. Eight years on, the risk has paid off with a smaller but committed congregation heavily involved in neighborhood ministry. What are the most pressing problems your church or organization faces? What would be the riskiest – but potentially most rewarding – responses? Yet the move incurred no small cost. The church lost about a third of its members. Friends parted ways, and some former faithful congregants were left bitter. The first few years in the new building were spent “grieving and healing,” Schrimpf said. However, many members who left were replaced by younger, more active newcomers to a congregation that now has about 200 members. They reflect changes in the Heartside neighborhood itself, which in recent years has seen a surge in hip restaurants and breweries, gleaming offices, and a major food market hugging a concert and sports arena. Jill Bosnjak and her husband, George, hold hands during worship with their children, Sasha and Alexa. Indeed, Bethlehem has turned much of its focus outward to the surrounding streets on the southern fringe of downtown. The Heartside Neighborhood Collaboration Project is a church ministry that coordinates the work of the district’s many missions and helping agencies, as well as other area churches, businesses and city police. Since its formation five years ago, the collaboration project has sought to improve efficiency, avoid duplication of services, and tackle problems like panhandling and increased bus fares. The church’s Music and Art for Justice in the Community ministry -- featuring concerts and art exhibits -- also benefits the neighborhood. Other Bethlehem programs continue work begun at the old location, but in a new context, such as the Hill Child Development Center, an accredited preschool and child care center. Its 50-plus children include Jill Bosnjak’s two daughters, as well as neighborhood children who live in shelters. 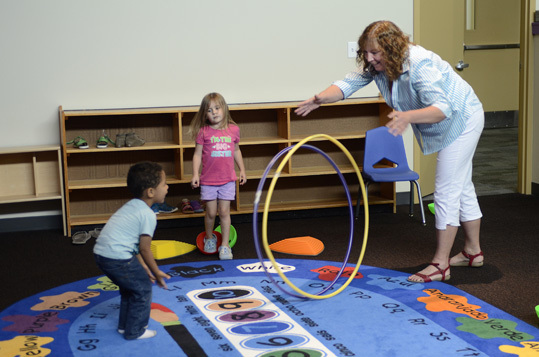 A boy and girl play roll hula-hoops with Sue Davidson, director of the Hill Child Development Center, founded by Bethlehem Lutheran in 1971. It is a new way of doing church for a congregation founded by Swedish immigrants in 1873. One of the older churches in famously devout Grand Rapids, Bethlehem followed the arc of many Protestant congregations here. Members initially met in homes, helped build the first sanctuary and weathered internal struggles. They dedicated their imposing neo-Gothic building in 1933, high above the city amid the grand mansions of furniture barons. 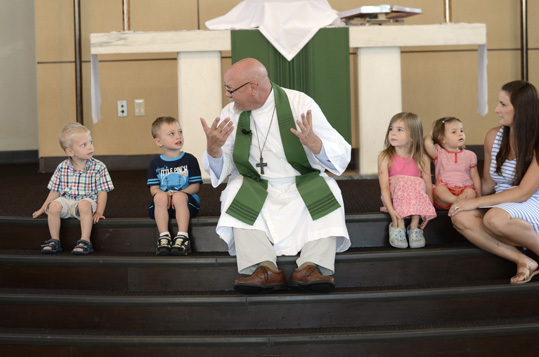 Forty years later, Bethlehem had swelled to 1,300 members, making it the second-largest Lutheran congregation in the city. The church supported efforts that put Heritage Hill on the national historic register in 1971. But by the early 2000s, membership had fallen to roughly 350 worshippers, about 135 of whom regularly attended. They were hard-pressed to pay the heat, light and maintenance bills of their aging building. Moreover, the church had “lost focus” and needed new energy, prompting soul-searching about the future, Schrimpf said. Bryan Bickford and his wife, Nancy, new members at the time, were the youngest family in the church and one of the very few with young children. The congregation was getting older and falling short of its social justice vision, Bickford said. How does your church answer Bethlehem Lutheran’s questions: Who are we going to be? Who do we serve? What's our mission? “We needed direction,” Bickford said. Then members learned it would cost $2 million to repair and remodel the church. Vision and reality knocked heads. “The church started to physically fall apart,” said Bickford, the church council president at the time. The balcony had to be closed at one point because of falling plaster, the building was not wheelchair-accessible, and the child care center had no elevator to reach upper floors, he said. Only after articulating their mission did members begin discussing the building’s future, Bickford said. He did not take that prospect lightly, Bickford said. He knew that the parents and grandparents of some church members had taken out second mortgages to help pay for the building. But despite loving the “gorgeous” space, he said, he and most other council members decided that selling was a better use of church resources. Some bitterly opposed the idea, arguing that the church could afford to stay in the building and that its potential was being squandered. Despite the painful divisions -- two council members ended up resigning in protest -- a majority of the congregation voted in 2006 to move ahead with a sale. "The church existed before 1873, and Bethlehem won’t exist forever. But God’s love will. So what’s the risk?" Painful as it was, Bickford said, he was at peace with the decision not to pour all the church’s money into the old building. 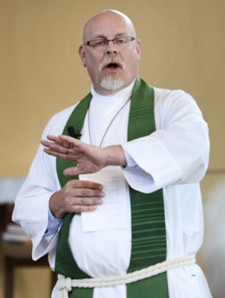 Those who wanted to stay were honoring long-held Protestant teachings that building and maintaining churches is “kind of an offering to God,” said Bishop Craig Satterlee, the head of the ELCA’s North/West Lower Michigan Synod. But the decision to move was a courageous and faithful response to new realities, he said. Can a church building still be an “offering to God?” How so? Bethlehem’s leaders saw its mission moving elsewhere -- to a plain, empty building in a tough area of town. 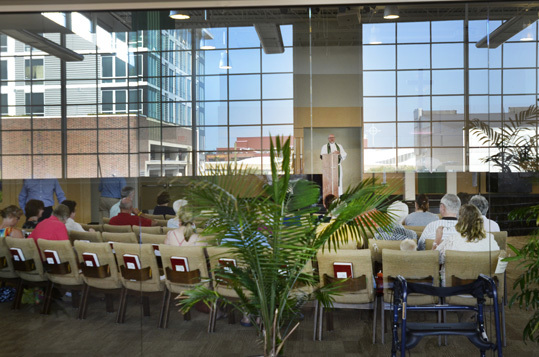 Reflections in the glass wall at the back of the sanctuary show the airy, light-filled view that the Rev. Jay Schrimpf gets from the sanctuary. Members voted in early 2007 to buy the former post office facility for $1.9 million, and they closed the sale of the old church for $500,000 to a developer. The former Bethlehem Lutheran is now a 22-unit apartment complex. Church funds ran low while they looked for a buyer for the old building's parking lot. A year later, the church sold it to a university for $2.7 million. Jill Bosnjak (right) joins her children and others on the chancel steps for a lesson led by the Rev. Jay Schrimpf. Bethlehem did it by pouring $1.4 million into the building. They built classrooms, offices and a theater-style sanctuary, where 100 people or so worship each week and benefit concerts are held. The building is more spacious than the old church and contains a parking garage. Despite his initial misgivings, Johnson grew to love the space and its worship, a blend of traditional liturgy, global music and challenging preaching. For a church committed to social justice, he said, the location is ideal. Since the move, more members are playing an active role in church life, Schrimpf said. Most are involved in some activity or ministry, whether singing in the choir or volunteering at a food bank. 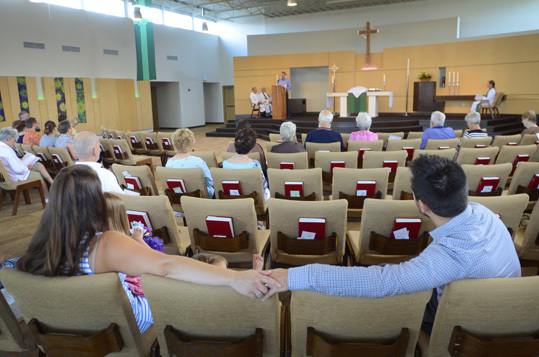 The church hosts meetings of Heartside agencies and often greets neighbors in worship. “We’re still a mostly middle-class congregation, but it is impossible to hide from the realities or inequities of the world in our location,” Schrimpf said. 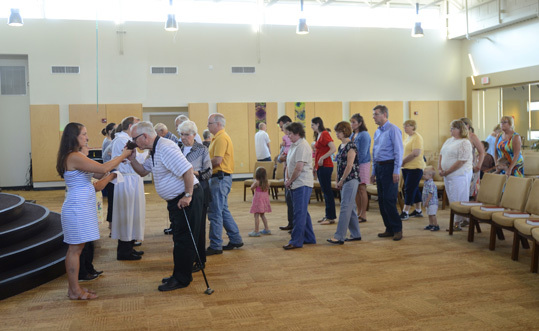 The congregation at Bethlehem Lutheran lines up for Holy Communion. How well connected is your church to the realities of its community and context? Jill Bosnjak likes being in the thick of all that. She and her husband drive in from a mostly white, rural community to worship and drop their two daughters at the Hill Child Development Center. She likes that her girls mingle there with children different from them. A lifelong Lutheran, she also appreciates the church’s emphasis on social justice, and its postindustrial setting. Churches such as Bethlehem, which leave their comfort zones to minister in rough areas, have something to teach others, said Satterlee, the ELCA bishop. Moving to Heartside enabled Bethlehem to welcome Orlin Wilder, 81, who lives in a subsidized apartment nearby. He attends faithfully and gives what cash he can to the child care center. Sitting in his sparsely furnished apartment, Wilder streamed Johnny Cash on his computer singing “I Came to Believe” and talked about how God saved him from a criminal past. He is glad Bethlehem came to Heartside. What is your image of church? What should one look like? To what extent is a building a part of that image? What are the most pressing problems your church or organization faces? What would be the riskiest – but potentially most rewarding – response? What’s the worst that could happen? The best? What role does your church’s building play in its ministry and mission? Where do vision and reality collide at your church or organization? What does it need to do to bring them closer together?